Hayes juniors Dominic Hupp, left, and Aaron Koehler, right, were recently recognized by the district for getting a perfect score, 36, on the ACT exam. 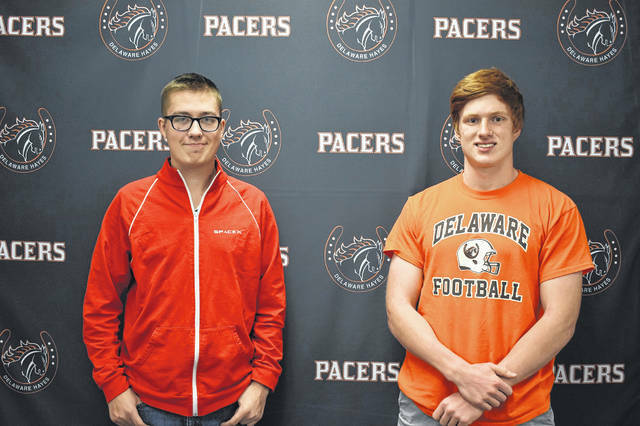 Two Delaware Hayes High School juniors recently earned perfect scores on their ACT exams, the first students in the district to do so in more than a decade. Aaron Koehler and Dominic Hupp both said they had taken the ACT before they took it last month and weren’t nervous going in. Koehler had also taken the ACT before and had also scored a 34 on his first go-around. Hupp said he was shocked when he found out he got a 36 — a perfect score. Koehler said he was “super relieved” after waiting weeks to get the score. Hupp said ACT sent him a letter reporting that only 4,000 students out of 1.9 million got perfect scores. Hupp said the school district also reached out to congratulate him and Koehler for being the first students to do so in more than a decade. “I don’t think I realized how rare it was until (the district) said that and we saw the numbers from ACT,” Hupp said. Koehler added he was confused by the recognition he’s received since the test. Koehler said he’s hoping to study engineering after graduation, but he’s also considering medicine or a combination of the two in a field like bioengineering. Hupp said he has his sights set on some type of engineering, either electrical or mechanical, or a degree in computer science.